"Bangor - Brewer Covered Bridge "
This black and white photograph shows a covered bridge built in 1847 that connected Brewer and Bangor, Maine. 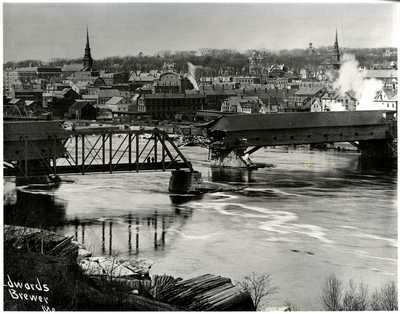 In March of 1902, ice that had jammed above the bridge began to break up and after first smashing against a Maine Central Railroad Bridge and tearing out a section of that, ice hit the toll bridge and took out the middle section. This photograph, labeled, "Edwards, Brewer, Me" in the lower left hand corner, appears to have been taken right after the 1902 event. This copy is included in a collection of postcard views of Maine, 1900-1950. No further information is provided on the back of the image.